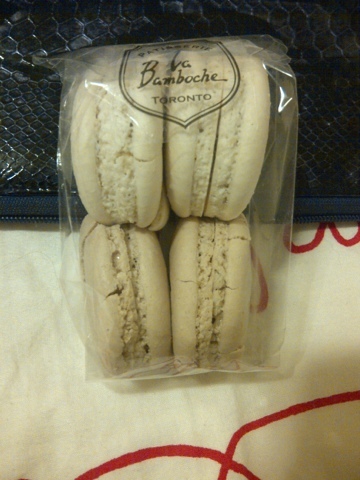 So today I had a pretty crappy day so I do what I always do when I have one of those days and that’s….buy macarons!!! They are my most favourite pastry ever!! My sweet tooth was salivating at the thought of all that meringue and sweet filling. My go to place for macarons is La Bamboche. In my opinion, they do the best macaron in the city. The meringue cookie is the right density – crispy outer shell with a chewy center. It’s chewy without being so chewy that you feel like its getting stuck in your teeth and ripping your jaw off. It’s just right. And that filling…oh that filling! Just delectable! It has just the right amount of sweetness. You can eat a dozen of these and not feel like you’re going to become a diabetic! But I’m sure that if you overindulge, you’ll become one anyways. La Bamboche offers a variety of flavours such as, Pistachio, Espresso, Yuzu, Mango, Chocolate, Cassis, Caramel Sea Salt, Mint, Strawberry Champagne and a Mystery Flavour. My favourite one is the lavender. It has a nice sweet, floral taste to the meringue cookie that goes so well with the chocolate ganache feeling. I am in heaven each time I take a bite. I believe that they’re $2.95 each, so they’re a bit pricey but they are definitely worth it! You can try all the other patisseries that offer macarons but you’ll come back to La Bamboche. This patisserie also has amazing cakes, breads and other dessert items. They also do a mean cappuccino. There are 2 locations, both of which have a seating area so you can enjoy your goodies in shop. I like to come here during the off peak hours whenever I can just to have a little “me” time. A cappuccino, a slice of cake or some macarons and a book is a great way to unwind. Here’s a picture of some macarons that I’ve brought home. I bought a dozen and here’s what’s left. Sorry about it being crushed. I asked for it to be put in packaging that wasn’t purse friendly!